Cracking deal over at The Works right now they are offering 2 Christmas gifts for just £10! 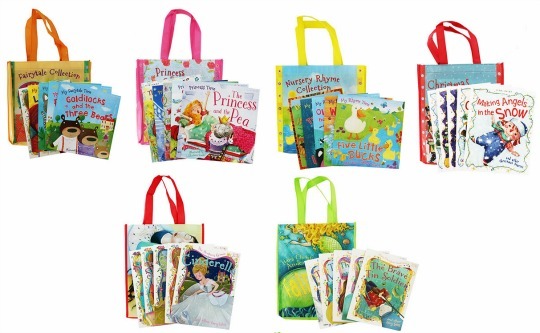 Included in this brilliant deal are several story book collections including 5 books in a cute matching bag. The contents of the bag's retail separately at £30 so you are getting £60 worth of books for just £10! These collections are perfect for giving as gifts, the little bag's are sweet enough on their own! There are several different collections to choose from, including: Princess Story Books*, Fairytale Story Books*, Nursery Rhyme Collection*, Christmas Story Books*, Horse Stories*, Hans Christian Anderson Books*, The Brothers Grimm Collection* and Silly Story Books*. These are definitely something to stock up on, great for keeping in for birthday parties especially. Home delivery is FREE if you spend over £20 otherwise delivery starts from £2.99. You can also use the Click and Collect option and have your order delivered to your local store for FREE.